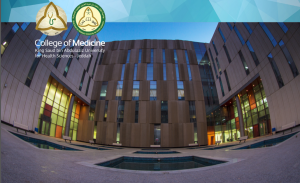 Welcome to the College of Medicine (COM-J), female branch at King Saud bin Abdulaziz University for Health Sciences (KSAU-HS), Jeddah. The female section will be opening its doors soon for the very first batch on the 18th of September 2016. High school graduates following two years preparatory program or bachelor degree graduates join our four years MD program. In COM-J faculty and students work hard at developing knowledge and skills to graduate high-quality doctors that will improve the health of their society and contribute to the advancement in medicine. At the Academic Affairs, we focus on the execution of the medical program curriculum, which includes preparation and monitoring of the academic calendar and student assessment. Strive for excellence is our day to day drive. We accept nothing but high-quality education to our students. Our unique curriculum which is problem-based, student-centered and community-oriented, ensures that our graduates have the skills necessary to access rigorous post-graduate programs both locally and internationally. The Prophet (?) said, “There is no disease that Allah has created, except that He also has created its treatment.”. Bukhari 7.582, driven by this Hadith and the verse from the Holy Quran ” And of knowledge, you (mankind) have been given only a little ” 017:085, students are encouraged to search for the best evidence, explore new knowledge and get involved in research at a very early stage of their training. I am confident at COM-J at KSAU-HS, each student is allowed to develop to their fullest potential. Wishing all faculty and students a wonderful experience at our college.